Originating from a small industrial mining town in Slovenia, their homeland is unique in that during WWII, they were occupied by Nazi Germany, Fascist Italy and Axis sympathisers Hungary. Slovenian history is far too complex to summarise, but the consequences were years of murderous civil unrest. It is clear that these political / social and environmental variables have informed LAIBACH’s songwriting and helped create their powerful industrial military sound. Moreover, in the past, the group has worn Fascist style attire adorned with Malevich’s black crosses. The overall effect has deftly confused the mainstream media of their political whereabouts and this confusion was exacerbated last year when the band toured North Korea. Depending on your viewpoint, these shows could be interpreted as either a wickedly subversive masterstroke to infiltrate a totalitarian country by playing songs from ‘The Sound Of Music’ (the premise of the musical being about a family, who want to escape a totalitarian country). Or, as an act of propaganda to support a regime with a brutal leadership and appalling human rights record. 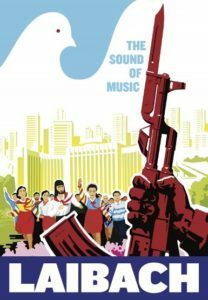 Whatever your views, this North Korean visitation has given the band a chance to deliver their own insubordinate version of ‘The Sound Of Music’ to a new and already anarchically minded audience in North London’s Kentish Town. The Forum was originally an Art Deco Cinema built in 1934, but there is an intriguing rumour floating around that the venue was constructed for Sir Oswald Mosley as an arena for his talks and furthermore, to accommodate his Fascist ‘Blackshirt’ following. There is also some online conjecture and some neo-Roman imagery with eagles inside the venue, which may provide some evidence to substantiate these rumours. However, it is a fact that Sir Oswald Mosley did march through Kentish Town and TEC would like to think that this tenuous link fits LAIBACH’s particular play with irony, as it certainly added an atmosphere of lawlessness past. Pre-performance, the atmosphere was set with the original soundtrack from ‘The Sound Of Music’ motion picture being played over the PA. Synthesizer players Luka Jamnik, Rok Lopatič and drummer Janez Gabrič commenced the show by building up challenging layers of piano and electronics which delivered a slow burning interpretation of EDVARD GRIEG’s ‘Olav Trygvason’. More auditory confusion was soon added by the growling sounds of baritone Milan Fras and the frantic screams of mezzo-soprano Mina Špiler; the entwining aural theatrics of LAIBACH began to spirit the audience away into a world of dystopian tales. 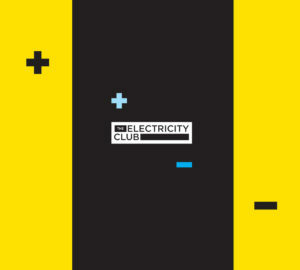 The first set mainly focused on tracks from their last Mute album ‘Spectre’, whilst other material was integrated from their early career featuring ‘Now You Will Pay’ and ‘The Great Divide’ from 2003’s ‘WAT’ . 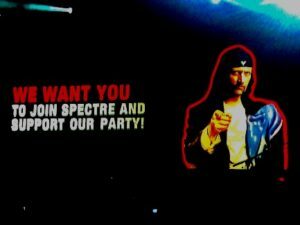 The performance included a rather comical fifteen-minute intermission, which flashed up Laibachian propaganda like “We Want You To Join Spectre And Support Our Party!”, never one to shirk on the finer detail, the band have actually set up their own movement complete with a party manifesto. LAIBACH launched the second half of the set with their visual and political interpretation of ‘The Sound Of Music’. Originally these songs were used in North Korea to teach Korean children the English Language. Apparently during the North Korean Tour, the band considered delivering a version ‘How Do We Solve a Problem Like Korea?’ but sensibly backtracked on that idea! Nevertheless, back in North London, this segment provided the undoubted highlight of the evening; the shock factor of hearing radically re-worked versions of songs such as ‘Do-Re-Mi’, ‘The Hills Are Alive’ and ‘Edelweiss’ even prompting an audience vocal shout of “what the actual f***!?”. 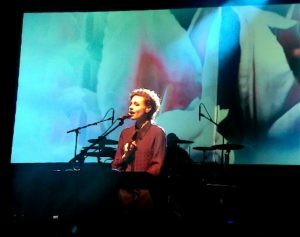 Once Mina Špiler’s superb vocals had blown Julie Andrews out of the water forever, LAIBACH then deployed their last single ‘The Whistleblowers’ with military precision. Proving themselves masters of the cover version, the closing songs were all interpretations of other artist’s works – BOB DYLAN’s ‘Ballad Of A Thin Man’, followed by their most well-known track, a Wagnerian-style cover of ‘Live Is Life’ by OPUS. The version aired tonight was not unlike PROPAGANDA’s ‘Duel/Jewel’, being that there was a schizophrenic split including a segue into German. The encore concluded with LAIBACH’s British National Anthem ‘Anglia’, followed by OSCAR WILDE’s ‘Each Man Kills The Thing He Loves’. 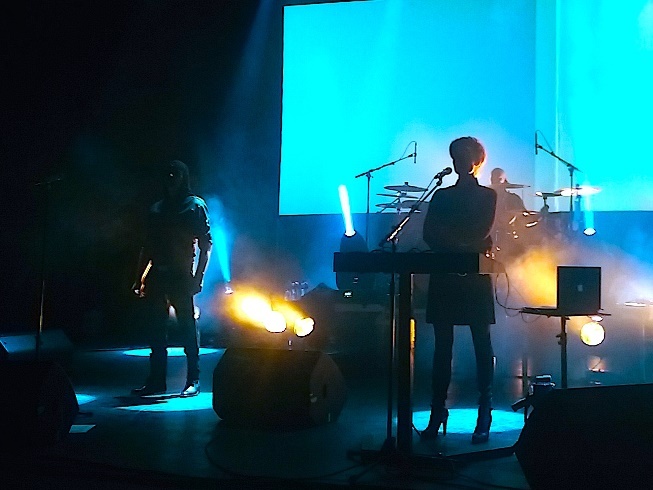 The show was a triumph and it is clear that LAIBACH still do not fear controversy or confrontation. However the years have softened the band and there are elements of subversive humour – from pre-recorded samples of rock ‘n’ roll clichés such as “You are the best audience!” and “We love you!”, through to sound bites of Margaret Thatcher which raised a few pantomime “boos!”. The band commands an undeniable power and there is a timeless nature to their music, whilst lyrically the songs have taken on more relevance over time and are at times acutely prophetic in nature. If anything, tonight’s performance will make both long-term fans and newcomers revisit the band’s back catalogue and will surely celebrate an act which has continued to evolve, shock, but ultimately entertain its growing audience.